It has been nearly 5 years since we wrote our first article titled ‘Why choose WordPress for your web design’. Back then, it was a fantastic blog and easy-to-use CMS (content management system) but how do things look for WordPress in late 2018/ 2019? Editors Note – Our original post was published on Feb 19, 2014 and we thought it would be useful for newcomers to receive an up-to-date version of the post. There are lots of CMS platforms to choose from these days and many people still have old static websites, so why should you choose WordPress. With there being so many high-quality content management systems available, it can be difficult to know which one is worth picking. In this refreshed version of our original blog post, we’ve made it user friendly for beginners. For those who are stuck on the question of Wix vs WordPress, please read on here. Now, let’s go into detail on why we think the benefits offered by WordPress are worthy of your time. WordPress is very user friendly but don’t let that fool you into thinking it is lacking features. With WordPress’ plugin options (allowing you to add specific functionality to your website) being in the tens of thousands, you’d be hard-pressed to struggle to find a plugin that meets your requirements. For those new to WordPress and CMS platforms in general, plugins can be installed and easily configured with no prior coding experience making it very easy to add new capabilities to the platform without knowing coding languages. Once WordPress has been installed, you rarely if ever, need to access an FTP client anymore as most of the plugins and editing can be done entirely through WordPress’ tools in a user-friendly menu. Uploading images, videos, and new pages, can be done simply through the visual interface for those new to content management systems and how they work. 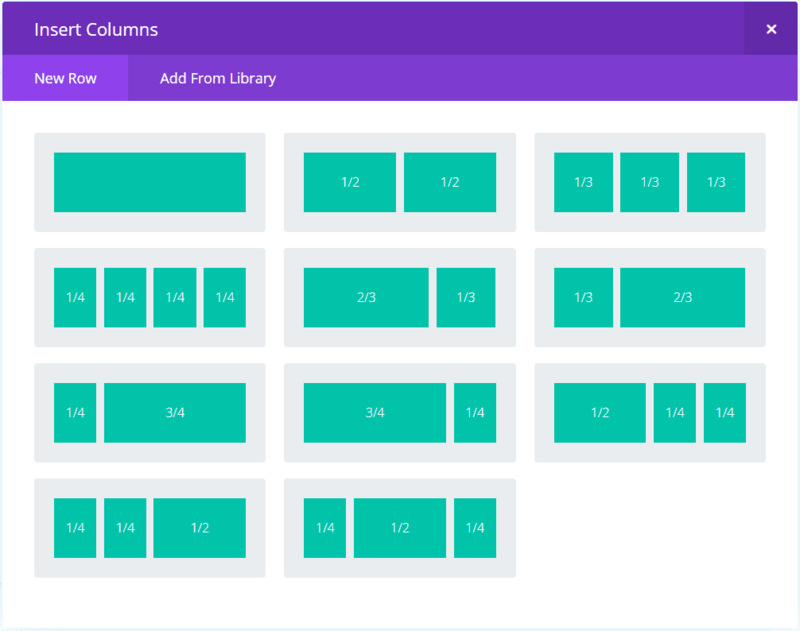 There are various themes and plugins available that offer ‘drag and drop’ Page Builder features, but our personal favourite is the Divi theme. This comes as a theme but is more of a framework for building modular WordPress websites that are can be loaded or created using common blocks or libraries, further simplifying the process of building your web pages with maximum control over your content. If you are new to WordPress or new to Divi, it can seem quite daunting at first but once you begin to dive in and get your hands dirty, you’ll find how intuitive the menus are and after a while you will realise that its all very simple – just stay with it! You have total control over the columns as you can see below. You will have access to pre-made ‘layout packs’ which even further simplifies the process of getting something up and running with maximum effect and minimal effort. Let’s talk more about plugins. Again, I’m writing this assuming you have little knowledge of content management systems so I thought it would be useful to go into more detail about plugins and what they are in WordPress and what they can do for you. A WordPress plugin is a piece of functionality either free or paid that can add features and functionality to WordPress with the click of a button. One installed, each plugin (typically) will have its own configuration options so you can further hone-in and really get things performing how you like. Let’s say you’ve installed WordPress, got to grips with the basics but realise you want to add a contact form that allows customers to fill out a form and request a call back. You can gain those required features (which you can easily configure without coding experience) via the plugin option and searching for ‘contact form’ and browsing the results for one that looks like a good fit. WordPress actually allows you to install plugins from the plugin search without the need for FTP access outside of the website, making things way smoother sailing if you’re new to WordPress and CMS platforms in general. The results will also specify whether or not the plugin is compatible with your version of WordPress, how many people are using the plugin, when it was last updated and also what rating it has received. If you’re new to all this, its best to think of WordPress as a platform that allows you to construct exactly what you want piece by piece or in this case plugin by plugin. Each plugin can be thought of as a jigsaw piece that fits together with others to form the picture you’re trying to create! When used in conjunction with a Page Builder like Divi, this allows for a very flexible and powerful way to design and build your website – and the best bit is that you don’t need any coding knowledge. For a useful and comprehensive list of plugins, check out our list here. How much will WordPress cost me? WordPress is completely free to download and install on to your purchased web space or hosting package. Typically, additional costs that you might run into, come when looking at customisation of your website and extending functionality, although this can usually be achieved with free themes and plugins. With WordPress, many great plugins are totally free that offer a wide range of extended functionality. However, there are certain ‘premium’ or paid-for plugins that often provide superior functionality to free plugins. Typically, the cost associated with these plugins are charged as a one-off purchase fee, monthly or even yearly depending on the service. In recent times the lines have somewhat blurred between plugins and themes with services that offer themes with drag and drop functionality for example. Typically, with a lot of premium themes you can expect them to be optimised for mobile (responsive) and very customisable with minimal effort which is ideal for those new to web design. Staying with the assumption that you’re new to all of this, SEO or Search Engine Optimisation is a vast topic but to sum it up simply, it is the act of optimising your website content to appear in search results for specific user queries, such as ‘Guitar Shop in Yorkshire’. This can be achieved by a number of optimisations that the website owner can input totally free of charge and with the help of fantastic SEO plugins like Yoast, you can easily optimise your WordPress website. What tends to happen though because of the depth and time associated with such a colossal task with many layers of the subject to learn about, WordPress website owners decided to go with an SEO agency to take the worry away and optimise their site to be found in search engines such as Google. Why upgrade to WordPress from a traditional ‘static’ HTML website? Back in the early days of web designl, websites were often used to display a few pages listing details about your business or service with contact information – nothing flashy or automated. These days, content management systems do all of the heavy lifting and automation plays a big part when it comes to updating and maintaining your website. A lot of people we speak to have had their basic static website for years and are quite apprehensive about replacing their trusted website, and understandably so. For those people, I just wanted to outline a few key differences between static and content managed websites. The great thing about WordPress is that it is a very secure platform. On the rare occasion that a security vulnerability is detected, all you have to do for the most part is sit back and wait for it to be fixed at which point an update will be available for WordPress. This won’t require you to reinstall or do anything complicated – you will see from the admin menu that a new update is available which can be carried out with the click of a button. Again, all the heavy lifting is done for you. Another key benefit of a CMS like WordPress is that fact that it is database driven and allows for automation and the website to be dynamic. This means that your website can work together to create much more complex tasks with minimal effort from the administrator of the website. A simple way illustrate this is to think of having a ‘new blog post’ section on your website’s front page that automatically pulls through content from your blog. An even simpler example would be publishing a new page which is automatically added to your menu. This message is worth repeating – you do not need any experience with websites in order to add new pages to your website site. As long as you’ve gotten to grips with the menus in WordPress and what they do, you will be able to add new pages easily without having to pay a web developer to do this. With static websites, the process of adding a new page requires HTML and possibly CSS coding knowledge and often needs the support of a developer. Just look at our original post from nearly 5 years ago and see how far things have progressed. WordPress first started off as more of a blogging platform and continued to expand and add features that the once small community had requested. Things are only getting bigger, better and more stable for WordPress users. Supporting the latest requested features such as responsive mobile friendly websites and constant security patches, it’s not going anywhere anytime soon. It can be scary to seemingly put all your eggs in one basket so to speak, but with WordPress you’re in safe hands. Plus, if you ever run into trouble Opace are here to assist you with any problems that you may run into should worst come to worst – we’re only an email or phone call away and with an ever growing number of positive reviews, you’re in safe hands! What about other CMS? Why choose WordPress specifically? It’s hard to find a one size fits all CMS solution to fit all specific requirements. WordPress has been available for a long time and has built a loyal following (and for good reason), meaning you’ll always be able to find a plugin that carries out the required function. Likewise, there are so many themes available, both free and paid, that you are guaranteed to find one that you like. If you can’t find a theme or plugin, then there are always developers available to help build something bespoke for you. We are big fans of other CMS platforms as well as WordPress. Going back to 2010, Drupal and Joomla were our platforms of choice, but WordPress has improved and evolved to such an extent that there is really no competition now. Taking a step back and comparing WordPress to Joomla or Drupal, makes it abundantly clear how far the CMS has come and how much it has improved in recent years. CMS platforms like Joomla and Drupal have never been as easy-to-use as WordPress and they can be seen as more of a ‘half way point’ for users familiar with CMS interfaces and coding. Although both of these platforms have improved significantly, they still feel somewhat clunky compared to WordPress. Another well received CMS platform for businesses with a background in Microsoft technologies is Umbraco. Similar to Joomla and Drupal, this is more geared towards users with some coding knowledge. There’s a perceived view that platforms like WordPress are at risk of being a ‘jack of all trades and master of none’. However, with the community creating diverse plugins for the platform, such as WooCommerce, WordPress is benefitting by having experts in their field creating new functionality without leaving us feeling like the platform is trying to do a bit of everything but never succeeding. Editors Note – Our original post was made live nearly 5 years ago and we wanted to provide newcomers with a refreshed version of the original article. You can still read the original article in its entirety below. As you are likely aware, there are many content management systems (CMS) available for download which have huge communities backing them in terms of support for new users, as well as supplying the ever expanding plugins library with more and more extended functionality. As mentioned in the above infographic, there are literally thousands of free plugins to extend the functionality in any direction you wish, making WordPress a cost effective and versatile content management system for a wide variety of projects. When using other systems in the past, as much as I liked the functionality and simplicity, I personally felt that some of the navigation, installation and implemented features felt clunky. Nowadays most content management systems have improved, but for me WordPress seems to have a premium high quality feel to it. You rarely see bugs or navigation problems, even when you are installing third party plugins. When WordPress first appeared, it was primarily a blogging platform and while it still very much is, it also offers so much more than that with many businesses using WordPress for their corporate websites. As you can imagine, with such a vast selection of plugins available, the versatility of WordPress continues to increase allowing useful features such as contact forms, interactive maps and animated image galleries and slideshows. Although not exclusive to WordPress, mobile-friendly responsive themes are available online from a wide variety of websites that give your website a consistent theme across devices that fits well to whichever resolution your device has at the time of viewing. What’s astonishing is that many of these are freely available and you are able to customise them to your own preferences and branding. One main factor that deters businesses that class themselves as ‘none technical’ is that their websites are typically difficult to update. With WordPress, you can easily log in, add menu items and add new content regularly without the need for a web designer. Widgets containing extra functionality (for example twitter feeds and streams) can be added simply too with little to no coding knowledge needed. Once the website has been hosted and initially set up, WordPress is very user friendly and easy to maintain and update. WordPress has a huge community of developers and loyal followers that are always pleased to provide support for their plugins, or just help with any issues that you might be having with your WordPress website. As mentioned previously, the plugins available provide additional functionality to your website and are thousands upon thousands to choose from. This makes WordPress very versatile and allows you to craft the website into anything you or your business wants. Plugins are updated regularly for the most part and are always improving based on community feedback. Of course WordPress is only one of many amazing freely available open source CMS systems out there and if you would like to research into alternatives, the following link is a great place to start: http://spyrestudios.com/free-content-management-systems. If you are considering making the jump to a CMS system, WordPress is definitely a good place to start for beginners and businesses. It allows you to easily maintain your website and extend its functionality, therefore future proofing your website without the need to continually pay for expensive enhancements. You can easily change or modify the aesthetic of your website without having to switch to another system. Best of all you are not locked into any specific supplier and there will always be a wealth of support available (both free and paid). At Opace we specialise in WordPress as well as Joomla and also Magento for e-commerce sites, all of which are freely available and open source. So if you have any questions, please leave us a comment or feel free to get in contact.